There are moments when you realize how small and interrelated the world is. Saturday morning was one such moment when the Tsunami warning maps were posted and one-fourth of the planet turned up as a potential target for the ripple effect of Chile’s gigantic earthquake. From Point 1 (Chile) to Point 2 (Japan) on the map above, is 10,000 miles. Granted, the waves were negligible and thank God for that, but I still find it amazing a seismic event that occurred in Latin America could impact Asia. 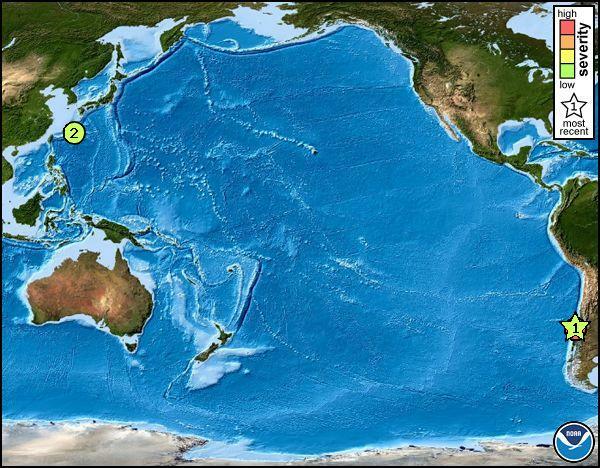 It certainly did on May 22nd, 1960 when the largest earthquake measured in modern history, a 9.5 also centered in Chile, killed 140 people in Japan due to the tsunami that was generated then. Despite the vast distances, it really is a small world. The last time I felt the closeness of distant places was October 29th, 1998 when STS-95 lifted off from Cape Canaveral with 77-year-old U.S. Senator and former astronaut, John Glenn aboard. It was my first and only in-person shuttle launch. What struck me then, besides the impact of the roar of the rocket that reverberated in my chest some three miles away from the launch pad, was how fast the shuttle was over Africa, just minutes after launch. Africa becomes one of the official emergency landing locations about 25 minutes into the mission after the craft can no longer make it back to Florida. I’d never put those two locations in my mind at once before- Florida and Africa. The whole world experienced a small earth moment on Christmas Eve, 1968, when the crew of Apollo 8 broadcast the famous image of Earth Rise as the blue planet rose over the barren landscape of the moon. Our concerns and our very existence seem parochial at times- so local and so small. To me, moments like global tsunami alerts, fast-flying space rockets and earth seen from the moon underscore not just the relative closeness of vast distances but also the temporary nature of humankind. On the cosmic scale, we just got here and won’t be here long. It’s rather humbling.